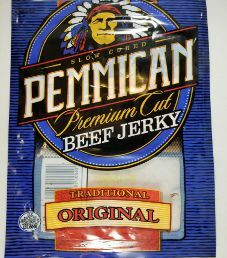 The next review on the Pemmican brand of jerky will focus on a 3.85 ounce/104 gram bag of their original flavored beef jerky. This bag was purchased at a gas station located in Jacksonville, Florida way back in 2009. 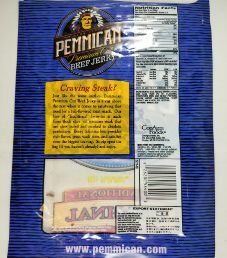 The Pemmican jerky brand name was manufactured and distributed by ConAgra Foods, located in Omaha, Nebraska. Traditionally, pemmican is a style of dried beef created by Native American Indians. It is a mixture of cooked, dried, and a shredded type of meat, combined with melted fat. Normally this is where we would list off the healthy ingredients added. There are none, unless the annoyingly vague term flavoring contains some spices. The sugar level is acceptable at 2 grams of sugar per 28 grams of jerky. The salt level is quite high at 610mg of salt per 28 grams of jerky to lose two ratings. Our preference is 350mg of salt or less per 28 grams of jerky. This jerky does not qualify to have no sodium nitrite added, as sodium nitrite is used outright as a preservative to lose a rating. This jerky does not qualify to be MSG free, as the highly processed cheap flavor enhancers hydrolyzed corn protein and hydrolyzed wheat protein are used to lose another rating. Back in 2009, I kept poor taste notes. I was also relatively inexperienced with eating jerky at the time. The only notes that I have indicated a good taste and texture, meaning the texture was dry. Also in 2009, I had not yet tracked purchased details. As a result, the exact cost of this bag is unknown. I will guess that this 3.85 ounce/104 gram bag cost $5.49. That works out to $1.43 an ounce, which rates as an cheap price. A slogan printed on this bag is “Premium Cut Beef Jerky.” Some facts printed on this bag are “Slow Cured” and “Traditional”. All bag categories are covered with this bag. Commendably, a toll free phone number is provided for customer inquiries. A good blurb is printed on the back about this flavor.